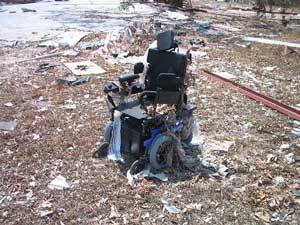 Global Warming Impacts And Disability - Why Is It Important? Global warming impacts will be felt by anyone. They are being felt! But people who have disabilities will feel the impacts of global warming far more keenly. But, surprisingly, the very group who is among the most vulnerable from these impacts might also have a guiding story for everyone! That's because engaging with human vulnerability and dependence raises consciousness about connection with each other and our Planet Earth, beautiful in its limits, its uncontrollability, its power and its frailty. Please help me map those climate change impacts on people who have disabilities, and, from their guiding story,work out a road map towards living with global warming! Keeping cool in hot weather comes up most frequently when people with disabilities comment on personal impact on them - and I'm one of them. The best three stories or pictures will win a prize that will keep you cool. I will select winning stories by January 15th 2008. Submit your story or picture and have a chance to win a Hydramistpak or cooling bandanna. A what?? Just click here, go to Personal Misters and find out more. Are you someone who has a disability and you are concerned about global warming and how it may affect you especially? Or you are family, friend or carer of a disabled person and you can see how the impacts of climate change affect that person? Telling your story is important! Well, I am Orthotist Prosthetist and been working the field for the past 25 years. Survival Of The Fittest Under Disasters?